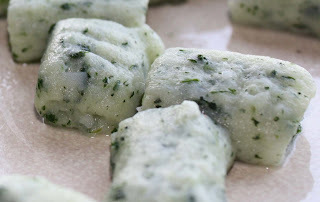 As promised earlier this month, more Welsh inspired recipes for St David's day via the West of Scotland, so here it is - my Welsh Goats Cheese Gnocchi with herbs. To enhance the butter sauce, as well as to make more of a Welshy meal of it - serve with sauteed leeks coated with copious amounts of double cream if you wish, but I like them simply sauteed in proper full fat butter to bring out their out their natural sweetness. If you don't fancy leeks, perhaps some seasonal winter greens or if your lucky purple, or even white sprouting broccoli. 2 tablespoons of fresh sage (or parsley) leaves, if small keep whole, if large chop them. For the gnocchi chop the potatoes into even sized pieces and boil them until tender. Mash the potatoes. Add grated cheese, egg yolk and season to taste. Add the flour and blend thoroughly. Take a handful of potato mix and roll into a long tubular shape and cut of pieces into an inch long and place onto floured surface. Do this until all the potato mix has been used. To cook gnocchi, drop batches into a large saucepan of boiling water. The gnocchi is done when it floats to the surface. Remove the cooked gnocchi with a slotted spoon until all are cooked. For butter sauce. Add oil and proper butter in a pan and fry garlic and sage leaves for a couple of minutes, then add the gnocchi stirring gently to reheat. Share out the gnocchi between plates and generously sprinkle over the grated goats cheese. Serve immediately with your choice of sauteed greens.